Aberdeen Storage Units is based on the outskirts of Aberdeen, on the A96 Inverness road in the village of Blackburn. We have been providing storage for over 20 years. 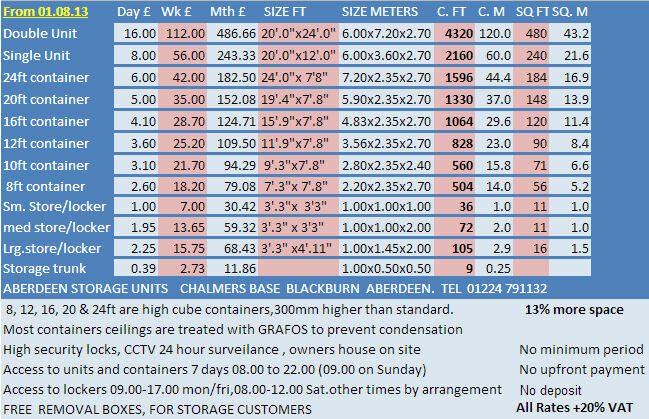 Visit our self-storage units and containers at Chalmers Base, Blackburn, Aberdeen, AB21 0SU. The ceilings in our containers are treated with grafo-therm to prevent condensation and are secured with high security locks, 24-hour CCTV surveillance, and the owners house onsite. The 8,12,16,20, and 24ft are high-cube containers, 12" higher than a normal container and with 13% more space. All containers ceilings are treated with grafo-therm to prevent condensation and secured with high security locks, 24-hour CCTV surveillance, and the owners house onsite. Access to lockers and trunks is available within office hours, otherwise by arrangement only with no minimum storage period. Storage trunks are available to rent with no upfront payment or deposit a forklift is also available, with all rates +20% vat. 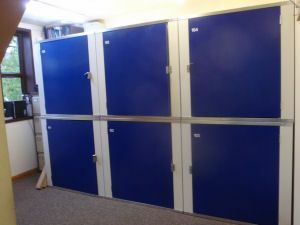 To keep your possessions secure contact Aberdeen Storage Units, with our self-storage units available in Aberdeenshire. Aberdeen Storage Units has provided space for the possessions of clients in Aberdeenshire since 2010. Based in the village of Blackburn on the outskirts of Aberdeen, our self-storage facilities are second to none, with large spacious areas and around the clock security ensuring your possessions are secure and stored comfortably.